Fangirls, I was raised a Jim Henson fan. I grew up with Muppet Christmas Carol as my holiday movie (I still try to watch it annually), and Muppet Treasure Island as my slumber party movie. When I was in high school, my mum introduced me to the Fraggles, a group of small creatures that live closer to you than you’d expect. So when I saw that there was a comic (and more than just one) from Archaia, I knew I needed it. The comic Fraggle Rock: Journey to the Everspring is written by Kate Leth and illustrated by Jake Myler. Though I’m more aware of Leth’s illustration work, I’ve known that she writes quite a bit as well, and was quite enthusiastic to pick this up. And let me tell you, Fangirls, I was not disappointed. 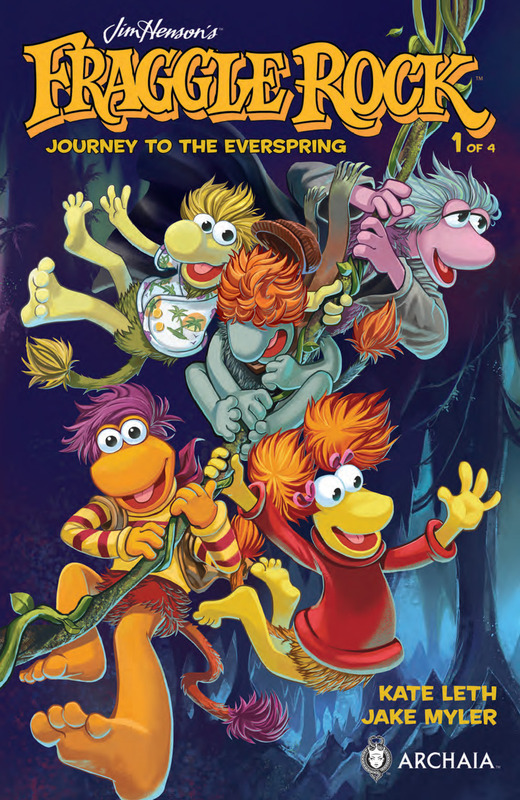 Journey to the Everspring follows the Fraggles as they make their way deep into the earth to check on the Everspring, as their water supply has run dry. Along the way, they sing songs about fear and friendship, and eventually make it all the way down, only to find that the Everspring is clogged! Through hard work and teamwork, the Fraggles (and pals the Doozers, both from Fraggle Rock and new Doozers from deep below), unclog the Everspring, and release water back into everyone’s lives. 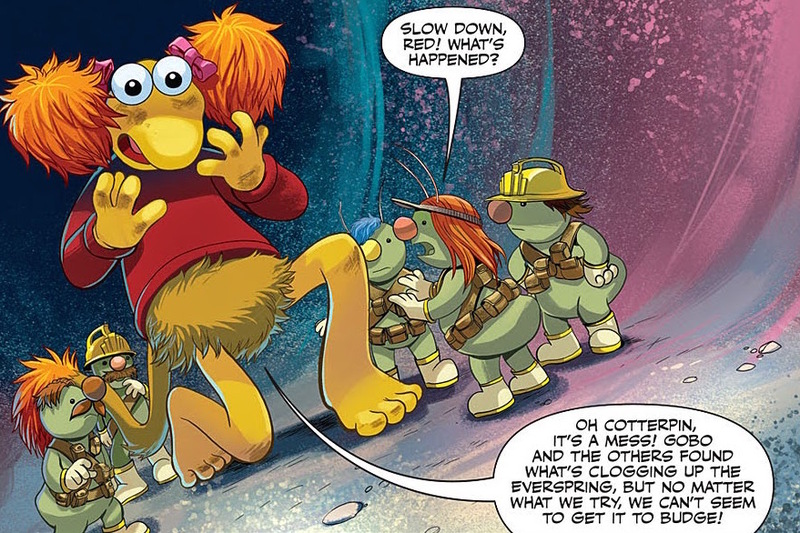 As the story finishes, Gobo (the main Fraggle, for those unfamiliar with the series), learns that though inventing may not be what he is best at, his heart and ability to bring Fraggles together (and Doozers! ), makes him a great leader. He kept his friends safe, and helped them feel secure when they were frightened, and learns how important that is. 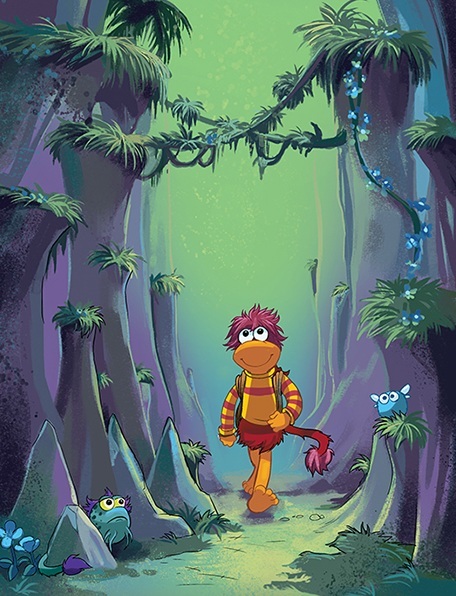 Fraggle Rock is an all ages show and comic, that I can’t wait to get more of. I found the songs to be adorable, the story sweet, and the art beyond beautiful; Myler really pulls you right into the world of the Fraggles. I treated myself, and bought the hardcover collection (which wasn’t expensive at $24.99), and I highly suggest it. Whether you’ve got kids who are on track to meet the Fraggles, or you’re a long time fan of the show yourself, this book is for you.